Perfect summer promo or cash-wrap title, from the ultimate authority on bartending, Bartender Magazine. 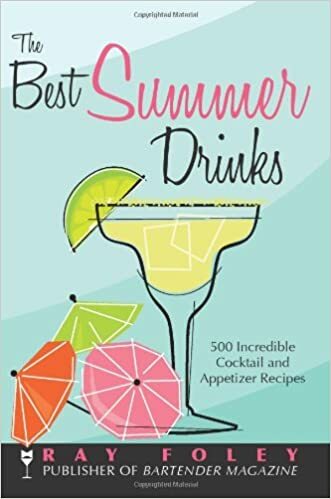 From Bartender Magazine, the number one publication for the bartending trade and the most respected name in bartending, comes The Best Summer Drinks, the perfect recipe guide for the hottest drink time of year. Perfect for impulse purchase at cash-wrap areas, The Best Summer Drinks is sure to find its way into the pocket of anyone who loves libations. 1½ oz. DeKuyper peachtree schnapps Orange juice to fill Shake with ice and serve in a tall glass. Peach Snap * * * 2 thin slices fresh ginger, muddled 5 oz. Stolichnaya ohranj vodka 3 oz. Hiram Walker white peach schnapps 4 oz. sweet and sour mix (Dissolve 1 tsp. sugar in 3 oz. water. Add 2 oz. lemon juice.) Candied ginger slice for garnish Shake vigorously with ice. Strain into martini glass. Garnish with the ginger slice, and serve. Peachtree Daiquiri * * * 2 oz. Strawberries for garnish Orange slices for garnish Lemon slices for garnish Lime slices for garnish Mix liquids in a large container. Chill for 2 hours. Pour the mixture over ice in a punch bowl. Float the strawberries and slices of oranges, lemons, and limes. White Peach Punch * * * Serves 10–20. 2 cups Stolichnaya citros vodka 2 cups Hiram Walker white peach schnapps 1¼ cups cranberry juice 1¼ cups pineapple juice 2½ cups sweet and sour mix (Dissolve 1 tsp. sugar in 3 oz. and walnuts. Mix sour cream and schnapps together, and pour over the ingredients. Toss gently, cover, and refrigerate for 4 to 8 hours. Garnish with the marshmallows before serving. Potted Bock Beer and Brie Spread * * * Makes 8 servings. 2 wheels baby Brie (about 13 oz. each), rinds removed 4 oz. sharp white cheddar cheese, cut into chunks 2/3 cup pale bock beer 1/3 cup finely diced sun-dried tomatoes 1 tbsp. horseradish sauce 1 tbsp. white wine Worcestershire sauce ½ tsp.